I wanted to make something fun for Boat Club this month, since it’s the last one before fall. 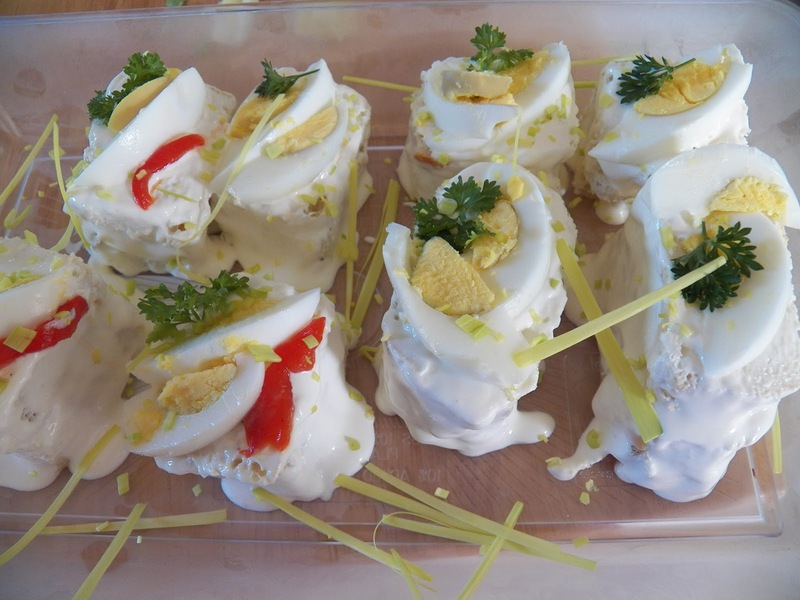 I decided to make some personal Smorgastarta, which are just basically a sandwich cake, but a fun one. 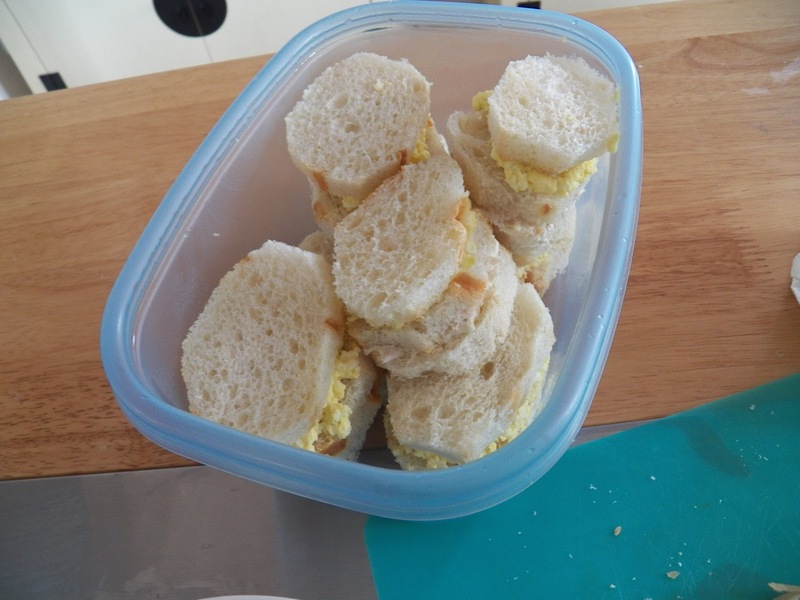 I had a couple of Hoagie Rolls in the freezer and I sliced them into thin slices, then layered egg salad and smoked salmon spread in-between the layers. 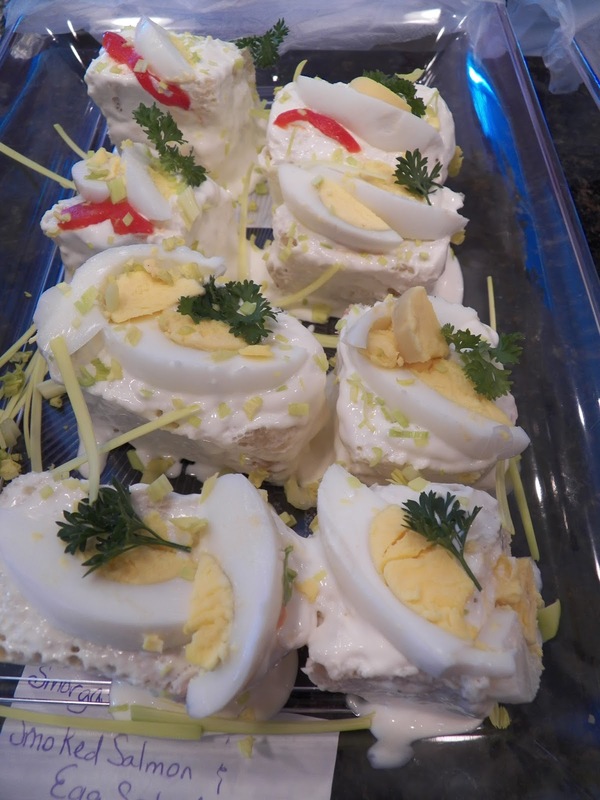 I also made up a few with egg salad and ham salad layers. I usually have fun in the kitchen when I’m creating, just not so much fun when it comes time to clean up, but I’m getting better at cleaning as I go. 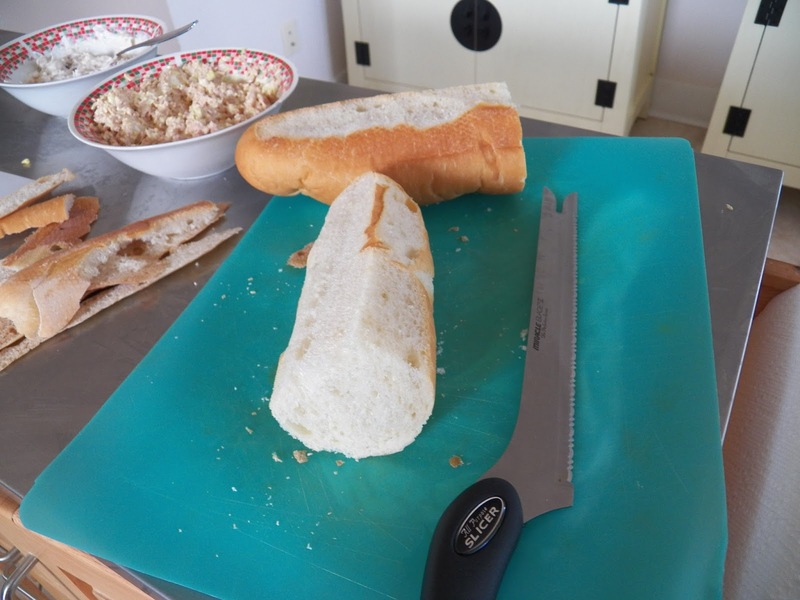 To start with, cut the crust off of the bread. And umm, it helps a lot if the bread is still frozen at this point, it was really hard to get the crust off the one thawed loaf. 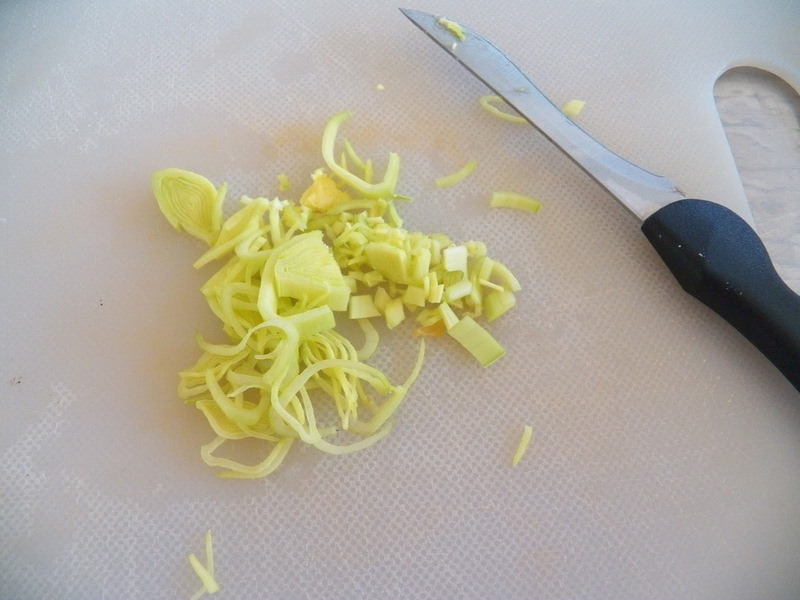 Then slice it into thin slices. And again, the frozen loaf worked out a lot better this time round. I used my new Miracle Blade slicer for this. I just bought the set, and the slicer and the paring knife are worth it in my book, both are super sharp. Just had to say that. 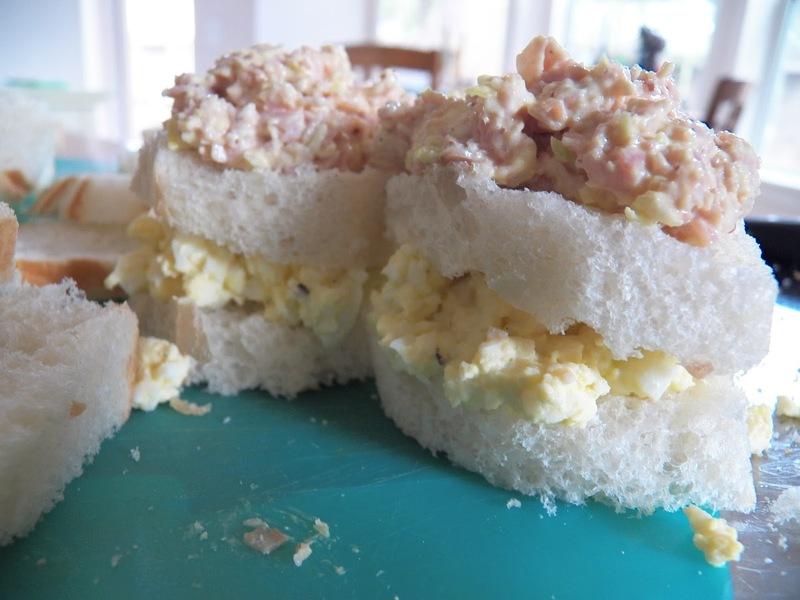 I used the ham salad spread recipe I made in January, with one exception, I used some thin sliced luncheon ham for the spread. And it worked out quite well. I didn’t have any scallions, but I did find one lonesome looking leek in the veggie drawer, so it was pressed into service. 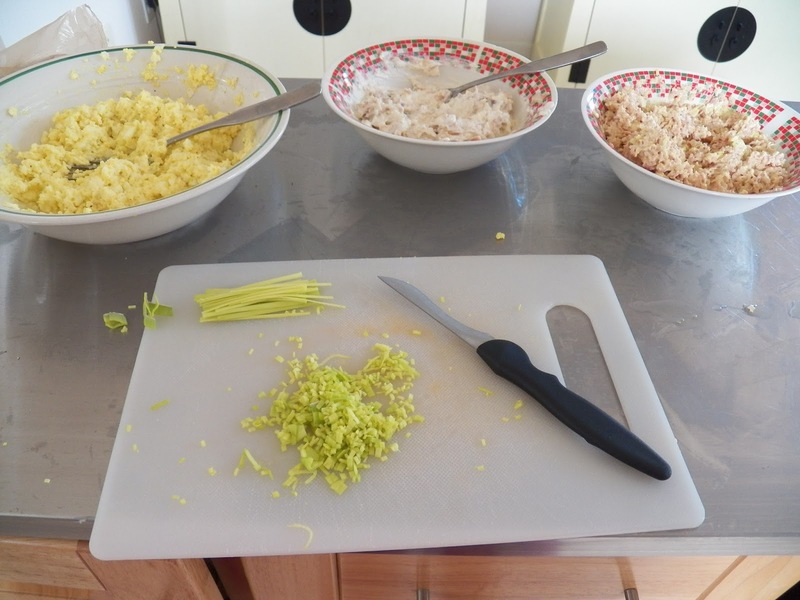 Leeks do tend to last a lot longer than scallions or green onions and make an admirable substitute when you want a little oniony flavour but you don’t want it to hijack your dish. I think I’m officially in love. 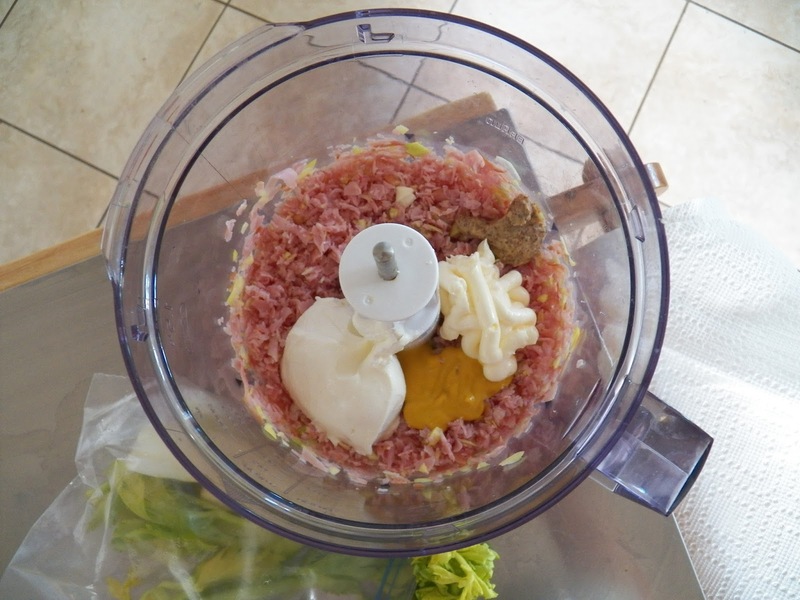 I placed a few slices of ham in here and let the food processor have its way with the meat. Added a little cream cheese, mustards, and mayo along with some of the chopped leek. 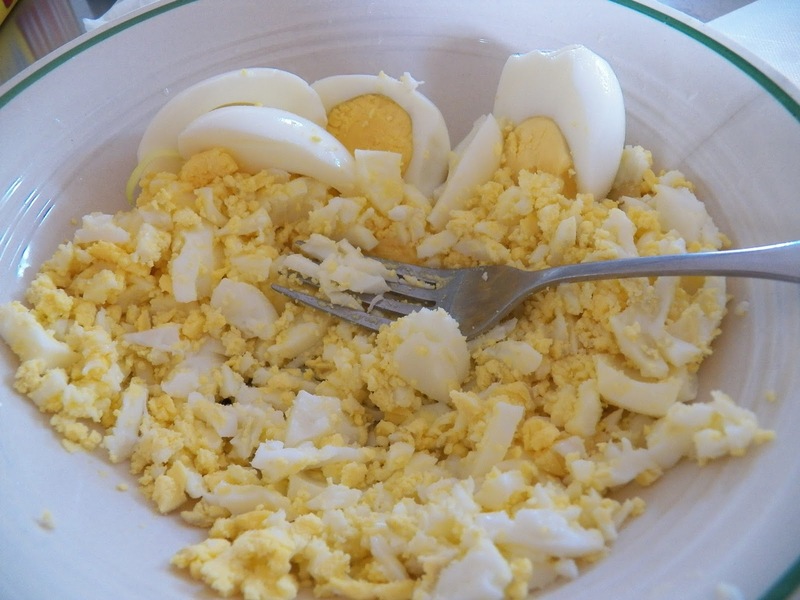 Mooshed up the hard cooked eggs, and added some mayo and mustard to them. The leeks just as I was chopping them up. 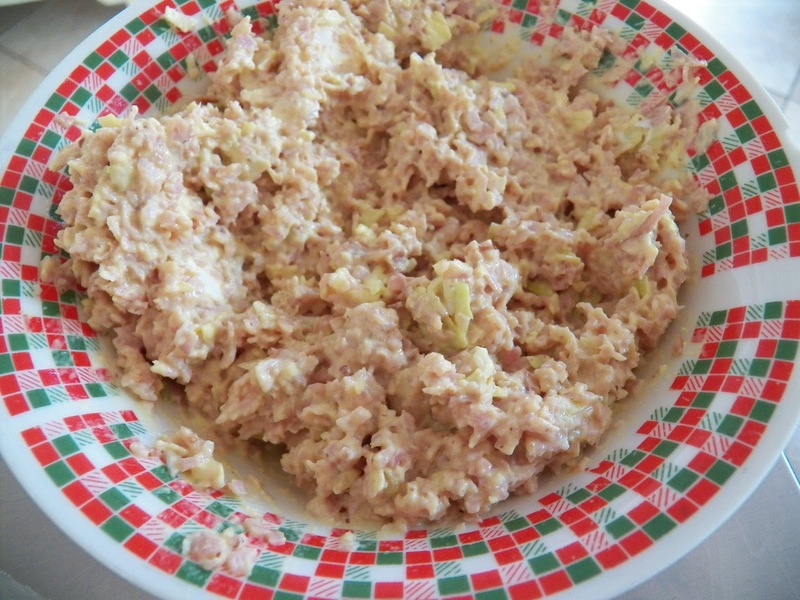 Deviled Ham Salad all ready to go. 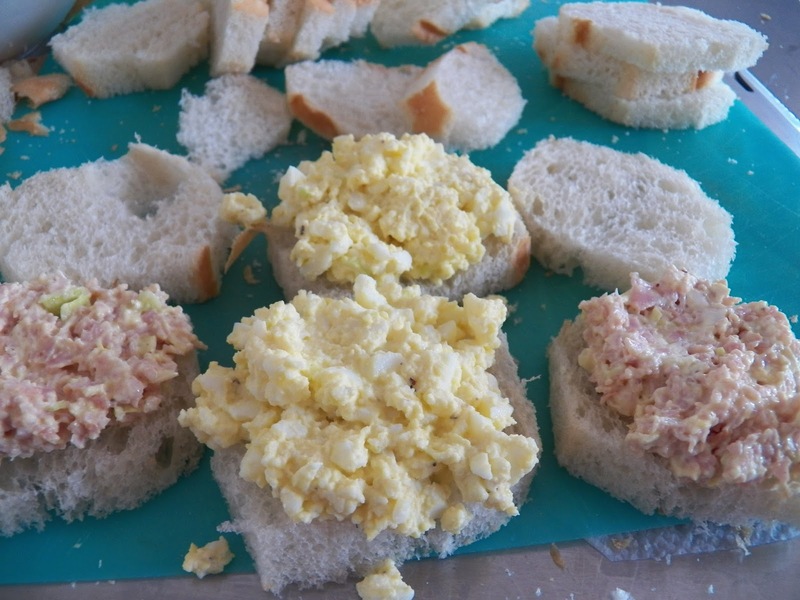 From the left, Egg Salad, Smoked Salmon mixed in with some cream cheese and mayo, and the Deviled Ham Spread. In the front Leek cut up and ready to decorate. 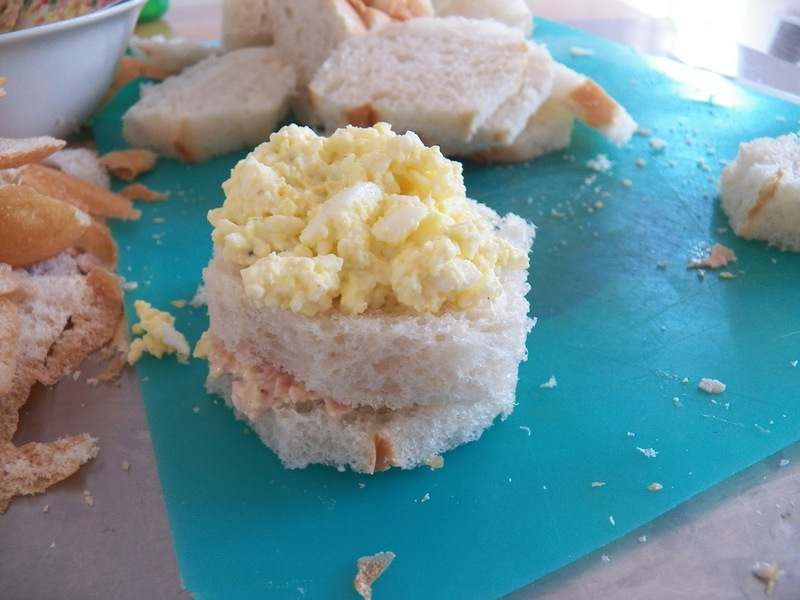 Spread some egg salad on one slice, top it with another slice of bread which has been spread with either the ham salad or the smoked salmon spread. Continue until all the slices are done or you’ve run out of one of the spreads. 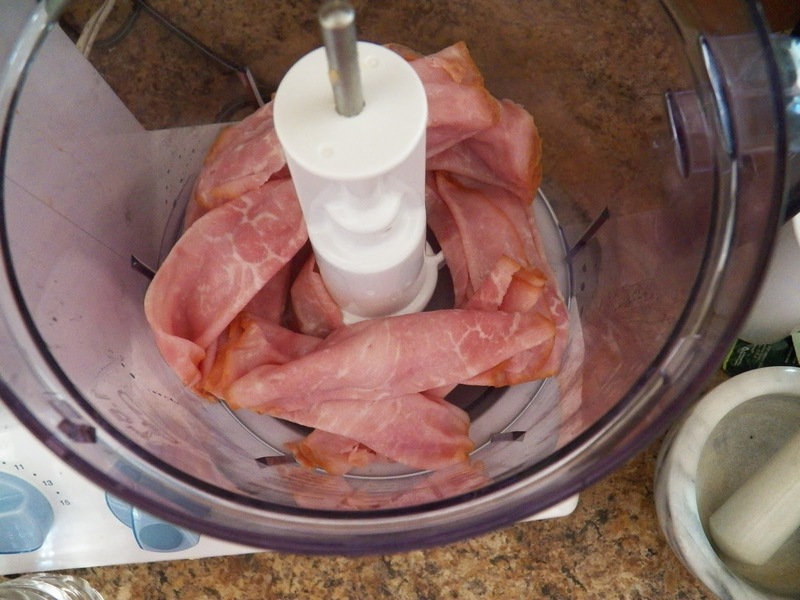 Place into a covered container and put into the fridge for a couple of hours. 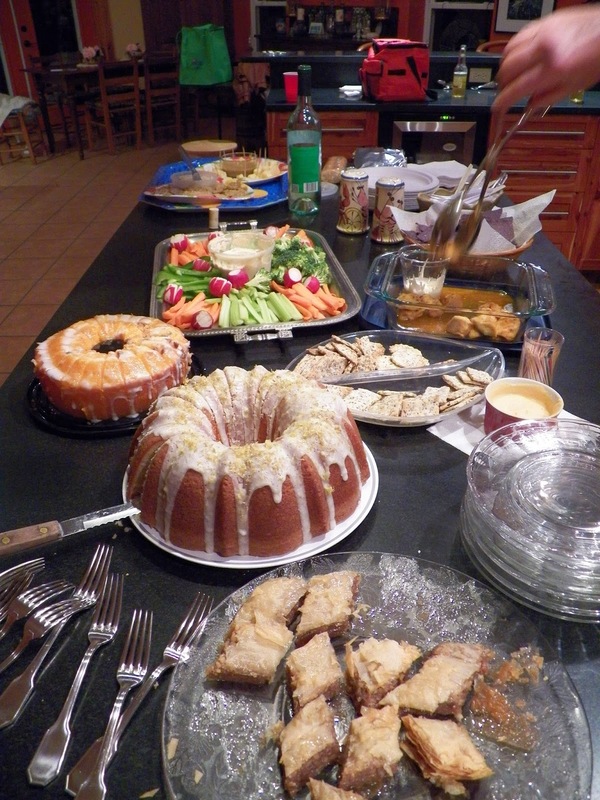 This gives the sandwiches a chance to rest and recuperate and also means you get to clean up the kitchen. After they’ve rested, you need to ‘frost’ and decorate them. 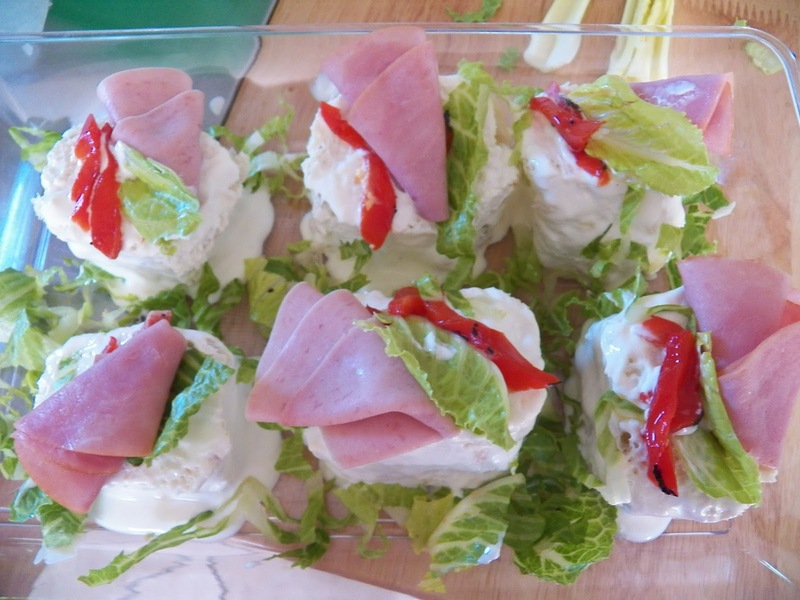 I used equal amounts of a good mayonnaise, in my case Duke’s Mayonnaise, Creme Fraiche and Sour Cream. 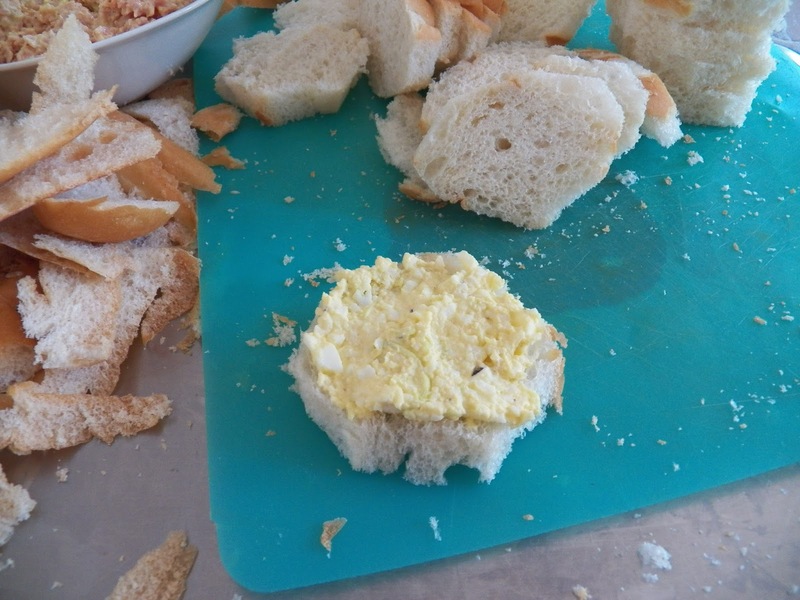 Mix it together and then spread the ‘frosting’ along the sides and top of the sandwich. Don’t worry about it looking pristine or even really pretty. You will be decorating them a little. I used a spoon to spread the ‘frosting’ along the sides and then spread a little on top, placed them on the serving platter and then I had fun. And forgot to take pictures of the just ‘frosted’ sandwiches. whoops. I then had fun decorating. You can do whatever your heart desires or in my case what I could find in the fridge. I really need to go shopping, soon. I used some of the leek I’d minced up, some of the hard cooked eggs, some parsley out of the garden along with some ham slices and the last of my jar of fire-roasted peppers. Mini Smorgastarta, and this won’t be the last time I make them. It’s just too much fun bringing them to the party. OK, so they’re tasty all by themselves. You were peeking in my kitchen, weren’t you? You saw me just eating them, plain, without anything on them. I did taste test a bunch of few crackers. 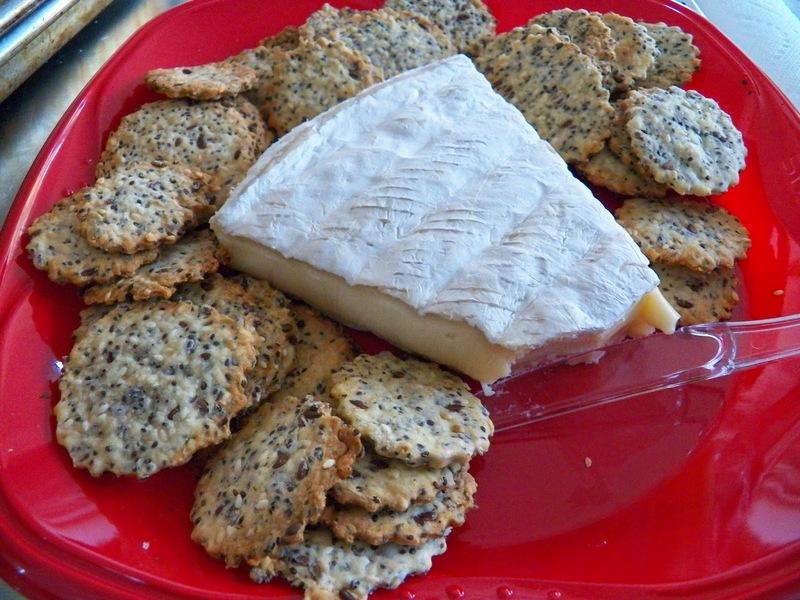 I baked some of the crackers according to the recipe, and then I had fun with the last half. I also changed up a couple of the ingredients, but that’s cause the big old bottle of poppy seeds, that I knew I had, in the pantry, are MIA. Here’s my take on the crackers. 3/4 cup water (enough to moisten the dough, maybe a little more or maybe a little less). Mix together, and let rest for about 15 minutes. 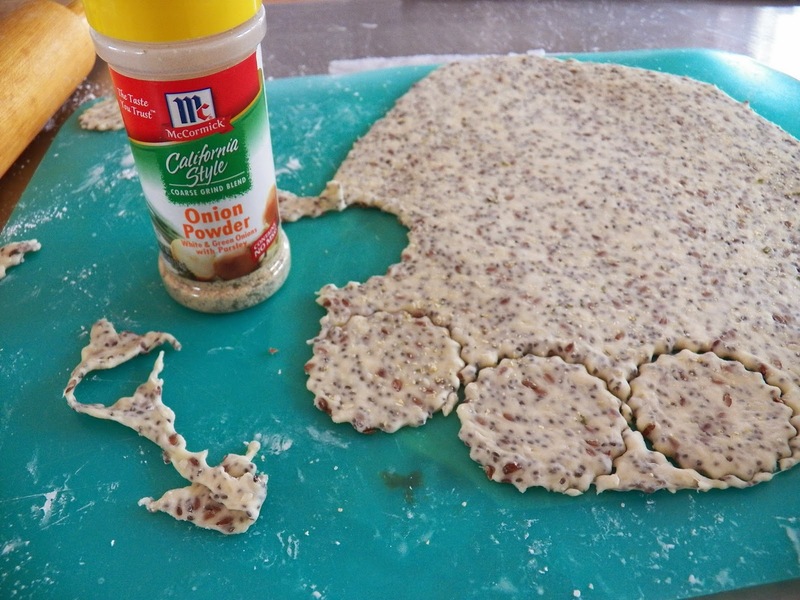 Divide the dough into either thirds or quarters, and roll out each piece until you get it thin enough. I made it about 1/4 inch thick, or maybe a little less. 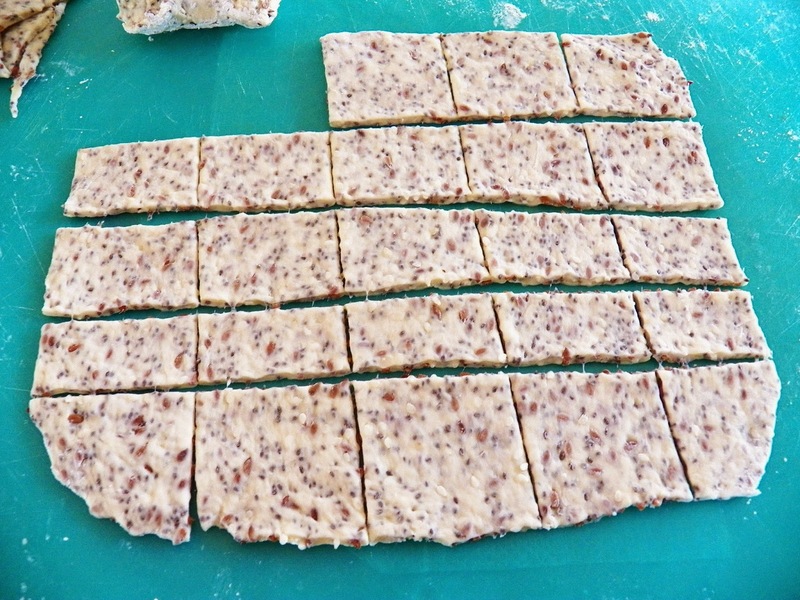 Cut into squares and place on a baking sheet, bake for about 12 minutes, or until the crackers start to brown around the edges. Take out of oven, taste test one, burning the tongue in the process, decide you need a touch more seasoning. So for the next batch I grabbed my onion powder and sprinkled just a little on top of the rolled out dough and then cut out some rounds. I reserve the right to change things up in midstream here. 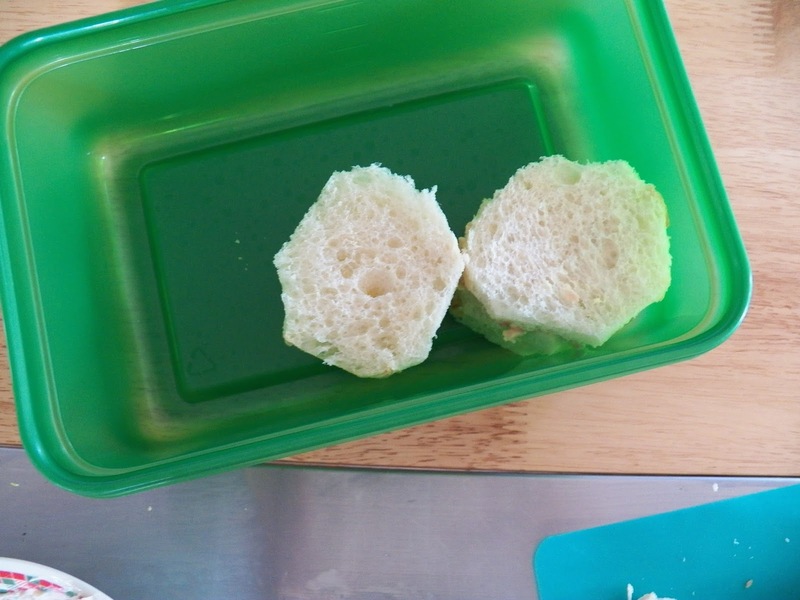 Baked them off, and then for the last bit of dough, I rolled them out, sprinkled some pizza seasoning on top, and cut them into diamonds and baked them off. I really like this recipe, it’s versatile, tastes great and best of all, I know exactly what is in it. I think next time I might add some sunflower seeds as well, or maybe just toast the sesame seeds a little to get more of a nutty flavour. I made some more last night for NPA and served them alongside a nice double cream Brie. They were a hit. Again. 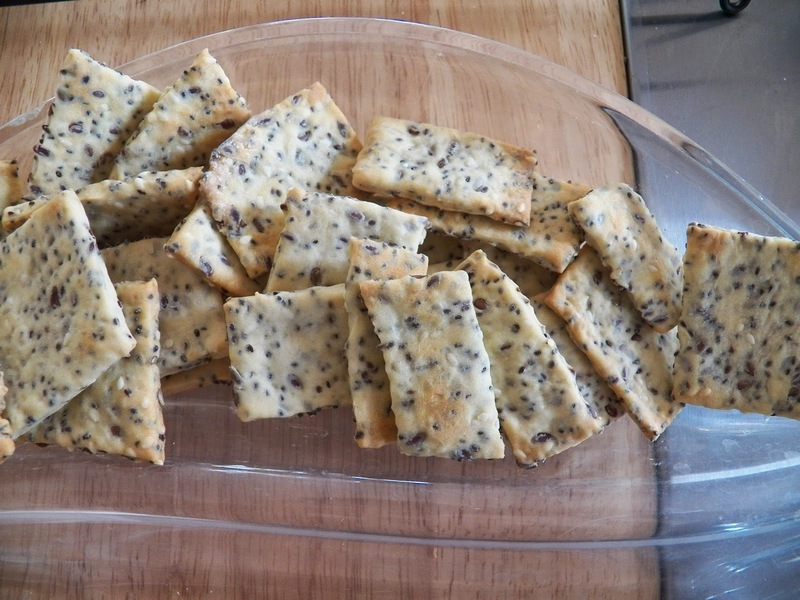 I swear I’ll never buy the seeded crackers again, these are so outrageously good, and best of all I know exactly what is in them. I do live in the Redneck Riviera and umm, I reserve the right to make my own ‘Crackers’. I got the coolest tool awhile ago from a friend. 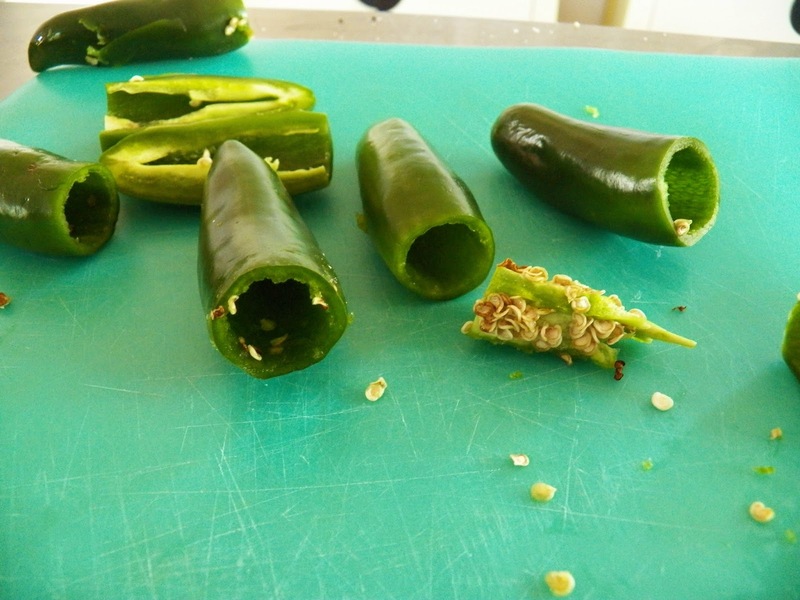 It’s to be used to core out Jalapeno’s. 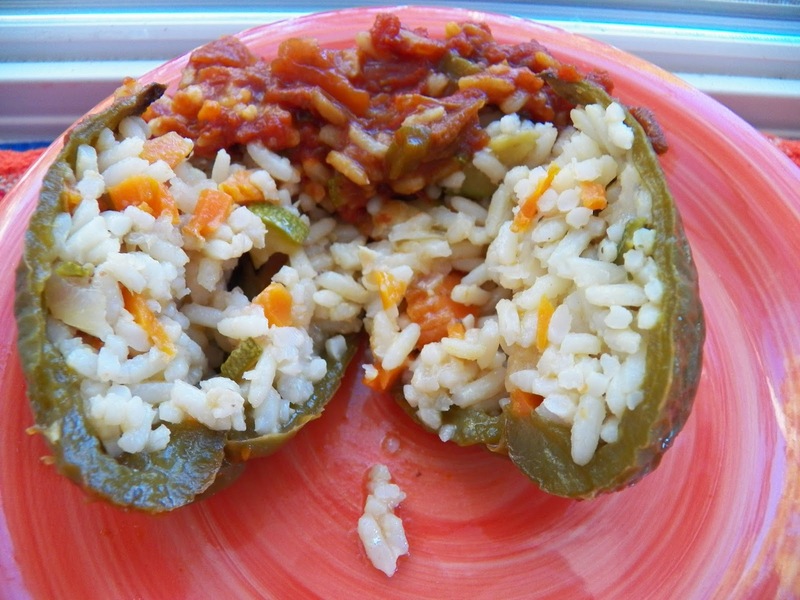 So you can actually make whole stuffed Jalapeno’s. It actually, umm, took me awhile to learn how to do it. I can be a little slow sometimes, getting a new concept into my head, that is. But once I do, watch me run with scissors. Sorry, but after some experimentation, I now core all my jalapeno’s before freezing them, well, apart from the ones I mash up, accidentally. 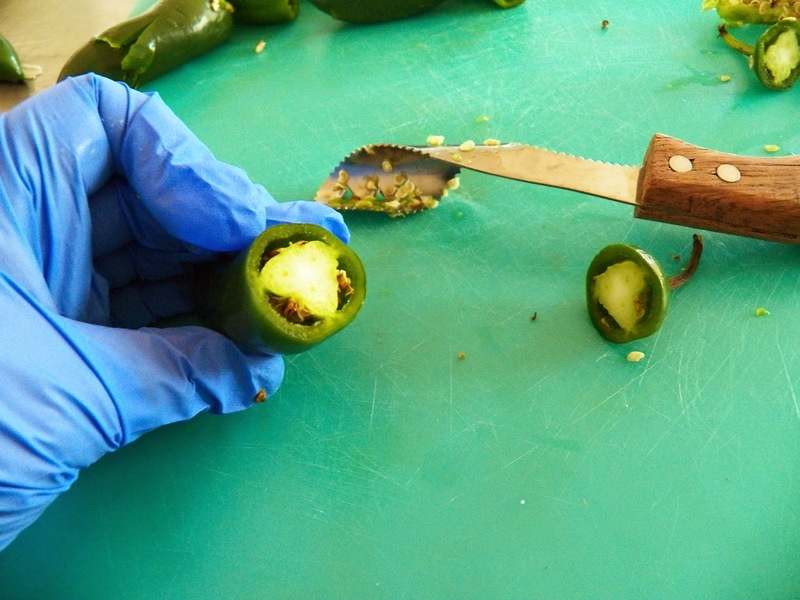 To start with, glove the hand you’ll be using to play with the jalapeno’s. I never mess around with this step. Trust me, but if you’ve ever brushed an eye or a nose when you have pepper juice on it, you’ll never use an ungloved hand again. 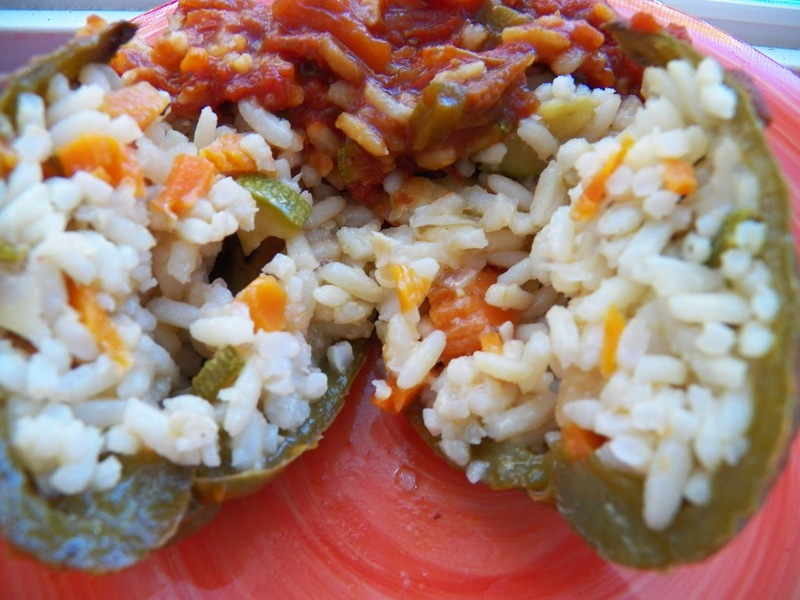 I’m also assuming that you rinsed the jalapeno’s off first, and patted them dry. 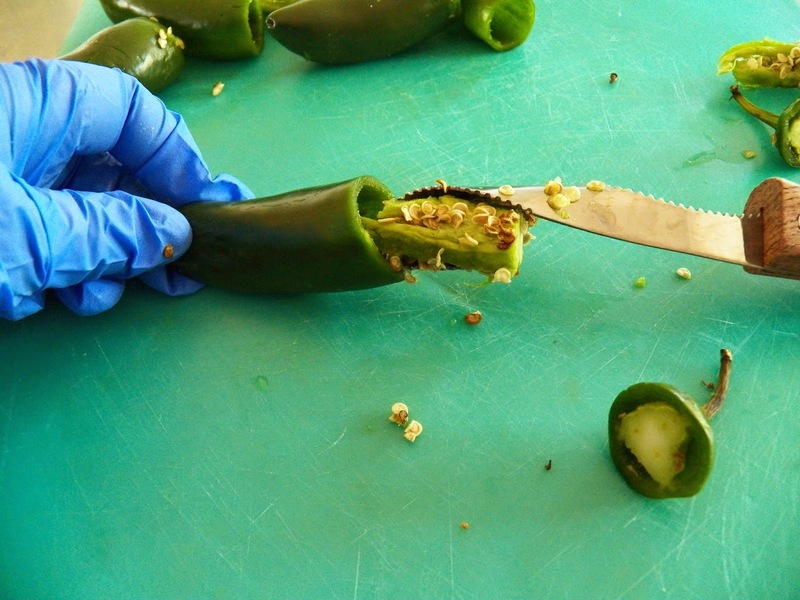 Take a sharp knife and cut off the top of the jalapeño. 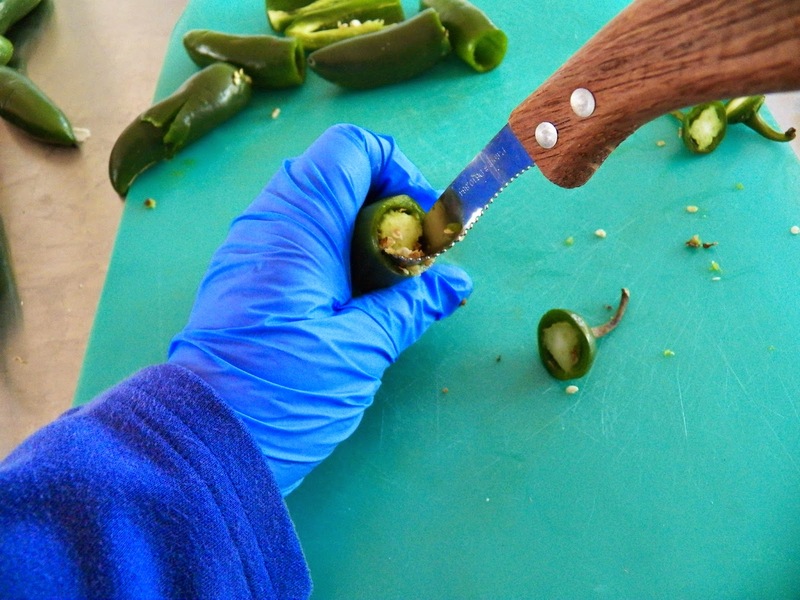 Then, taking this really cool tool, insert the sharp bit into the jalapeño, twisting clockwise and counter-clockwise to release the little seed parcel. Pull the seed parcel out with the tool, and set aside. Proceed to the next one and continue the process until all the Jalapeno’s are seeded. There is a mangled pepper in the back there along with one I did the old-fashioned way, which entailed cutting it in half, and then digging out the seeds. The corer makes it a lot easier, and quicker. And they’re cute to boot. You can now stuff them however you like, do as I did, put them into Ziploc bag and into the freezer for future seasoning and eating possibilities. I suggest using a mixture of cream cheese and sausage, although you could also stuff them with some Cheddar Jack cheese, wrap them in bacon and broil them. I have an idea, I think I see a new appetizer in my future. I’ll share the how to’s as soon as I do them. In the meantime, if you happen to see one of these corers running around, catch it and try it out yourself.